RUSH: The College of Cardinals is now entering the Sistine Chapel to begin the conclave to elect the next Vicar of Christ. For those of you in Rio Linda, that would be the next pope. For those of you who are Italian, it would be Il Papa. You may not know this. Yesterday on CBS, Slay the Nation, they had a roundtable. Bob Schieffer had Washington Post columnist Sally Quinn and Carl Bernstein on from Vanity Fair. Bernstein of Woodward and Bernstein fame. And they were talking about the church, the Catholic Church, and the selection of the new pope. Listen to this. BERNSTEIN: …have other gay friends…. But then beside that, did you also notice Sally Quinn — and Bernstein agreed with her — “The Catholic Church is on its way to irrelevancy if they don’t start including women, people of other color.” Does she realize that the next Il Papa might be from Africa? Other color? People of color now has become people of “other color.” What is the other color? Mocha? No, seriously, what is the other color? Is it Asian? I don’t know how these leftists think. I take that back. I know exactly how they think. I have to take time to study. I don’t think of people as colors. Sally, people of color, that’s always meant African-American or black. Now people of the other color? Does that mean we’re looking beyond African-American now? Or is African-American the other color? Well, who knows? Doesn’t matter. It’s still not my primary point. My primary point, at least the thing I got out of this, “the Catholic Church is on its way to irrelevancy if they don’t start including women, certainly people of other color, and ultimately homosexuals. I mean, they’re all against homosexuality even though so many priests are gay.” And Bernstein starts talking about all the friends he’s got in the priesthood who told him about all the gay cardinals and Schieffer tightened the belt and went to commercial break. Now, I just want to ask you, would Sally Quinn or Carl Bernstein or any two other American liberals ever go on television and say that Islam has to recognize people of other color and homosexuals if it’s to remain relevant? Would they ever say that? Would they ever go on TV and warn these militant Islamists, “Hey, look, you guys, unless you start recognizing women, tell ’em to get rid of the burqa and people of other color and homosexuals, you are going to become irrelevant.” Would they ever say that? Of course Sally Quinn would never say that, would never tell Islam that it has to recognize homosexuality. But, anyway, I’ll tell you what I think. If we’re gonna talk about the irrelevancy of the Catholic Church, can I enter that fray? I would say the Catholic Church is on its way to irrelevancy if it doesn’t start distancing itself from the Democrat Party and the idea that liberalism equals charity. Because liberalism does not equal charity, and that’s how the church got sucked into supporting Democrats. Not just the Catholic Church, but all religions got sucked in to supporting the Democrat Party and all these movements, all these social causes, because they began to equate government largesse with charity. And it isn’t. The government is not a charitable organization. Charity exists because people willingly donate their own money to the cause. That’s not what happens with government social programs. That money is extracted from people, and it’s spent on things that many people would never spend that money on if they had any control over it. But the church got roped in, and they weren’t the only ones that got roped in. RUSH: Hey, I got some questions about the election of the pope. 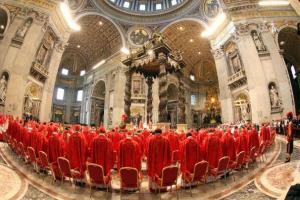 Is a photo ID required of the College of Cardinals before they can vote? And I wonder, is there any early voting? Like, have some of the cardinals already voted and we just don’t know about it? You know, did they vote before they got to Rome just to make sure that it didn’t happen? No early voting? What about absentee ballots? Any absentee ballots in the election of the pope? None of that? I mean, they vote right there when they go in, like it used to be here? You know, we had Election Day and people would go vote? What about exit polls? Is the media over there gonna collect exit poll data for the election of the pope? Just the smoke, is that it? Black or white smoke, or smoke of “other color.” Smoke of other color. Because now Sally Quinn has said the church, in order to become relevant, is going to have start including women, “people of other color,” and homosexuality. RUSH: If a member of the College of Cardinals in the Roman Catholic Church is a Democrat, can he vote twice? Can he vote more than once for the pope? I’m just asking. I’m trying to equate this with elections here in America. Now, can dead cardinals vote as dead Democrats vote in Chicago and Florida? Probably not. I’m just raising the question.